To Ora on the "Ships starting with O" page. Built in Malmö, Sweden in 1937. Guestbook message from someone whose father, Thoralf Frømyhr, served on this ship from Febr.-1941 until Jan.-1943. As will be seen when going to Page 1, the name has been cut off. Page 2 had no name at all, but I believe both documents show Ora's voyages. Aug. 8 Brisbane Newcastle, N.S.W. Aug. 10 PG 8A Convoy available via link above. Missing 1942 voyages, Page 3. *Aden is not mentioned on the archive document, which says she arrived Lourenco Marques on March 15, proceeding to Durban on Apr. 2, wtih arrival Apr. 4. Apr. 7 Durban   DN 31 Dispersed Apr. 9. Page 3 gives arrival Bahrein, Apr. 26, left for Melbourne Apr. 29, arriving May 29. June 7* Melbourne Sydney, N.S.W. June 10 OC 98 *Page 3 gives departure June 2, via Geelong for Sydney. Nov. 3 Bandar Abbas Bombay Nov. 9 PB 62 Convoy available via link above. Dec. 5 Bandar Abbas Bombay Dec. 11 PB 66 Convoy available via link above. For information on voyages made in between those mentioned here, please see the documents received from the National Archives of Norway. A. Hague's Voyage Record above has convoy information for some of them. According to Page 1 of the archive documents, Ora arrived Abadan on Apr. 7-1940, 2 days before war broke out in Norway. Departure Abadan is not given, but she later arrived Bombay on Apr. 13. Her 1941 voyages also start on this document and continue on Page 2. It looks like she spent almost a month in Bombay that year. She had arrived there from Karachi on Oct. 28-1941; departure is given as Nov. 25, when she proceeded to Abadan, with arrival Nov. 30. The page also shows a few of her 1942 voyages (she also spent about 3 weeks at Bombay in March that year), while the rest are listed on Page 3 - as can be seen, a month was spent in Durban, before she left for Bahrein on June 2. It'll also be noticed, that she appears to have stayed in Los Angeles for several weeks, having arrived there from Sydney, N.S.W. on Oct. 14; departure Los Angeles is given as Dec. 4. She went back to Sydney again later that month, arriving Jan. 14-1943, continuing to Melbourne 2 days later. On Febr. 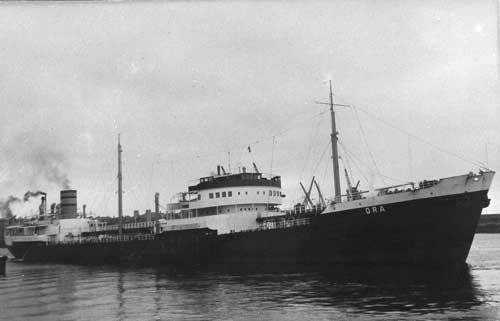 5-1944, Ora rescued 37 survivors from the British Fort Buckingham, which had been torpedoed and sunk by U-188 on Jan. 20. The Norwegian Kongsdal also rescued survivors from this ship. Please see the last 2 external links provided below for more details on the rescue. The first account states that Ora was bound for Australia with aviation fuel at the time, so the survivors were transferred to HMS Redoubt and later landed in Bombay. According to Page 4, Ora had left Bandar Abbas on Jan. 30 and arrived Melbourne on March 1. Her 1945 voyages also start on the document referred to above, while ther rest are listed on Page 5, which also shows some early 1946 voyages. According to this external page, she was converted to ore carrier, delivered in Sept.-1955, 9654 gt, 14700 tdwt. Laid up in Arendal in the summer of 1959. Sold to Spain for breaking up in Dec.-1966, departing Rostock Jan. 14, arriving Bilbao Jan. 19-1967. Fort Ships of WW II - Fort Buckingham is listed on this page. A WW2 survival story of the U-Boat U188 and two of her victims. Details of Ora's rescue of survivors from Fort Buckingham are included in this account. The page also has a narrative of the time spent on rafts. Rescue of Fort Buckingham survivors - As told by a crew member, Norman Gibson (as is the account at the link above). Includes crew list. Back to Ora on the "Ships starting with O" page.